If you’d prefer your first time flying a drone not to include close up shots of leaves and large amounts of cursing, we suggest taking a deep breath, slowing down, and doing a few things before your maiden flight. First and foremost, rip into that plastic bag holding the manual and pull it out. Then, actually read the thing. Seriously. Pay special attention to two items. First, memorize the button or sequence of buttons that initiates the drone’s “return home” feature. 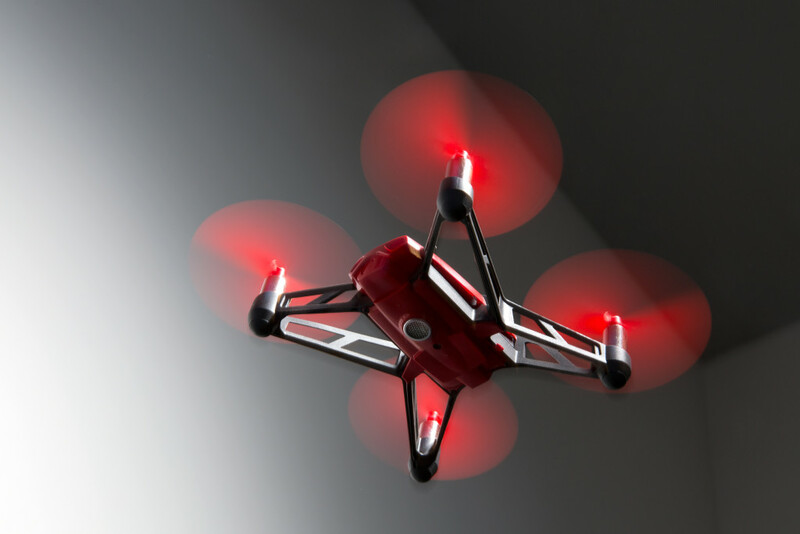 This varies between manufacturers and models, but newer versions tend to have some kind of single button “oh crap” feature that will send the drone back to where it started. When you’re first learning, this will be your most used flight control. This is also a good place to suggest your consider joining the Academy of Model Aeronautics for $75, which, in addition to a magazine subscription, will get you some basic insurance coverage should you crash. Next, update the firmware. Even new drones often leave the factory without the latest updates, and you might be able to get some new features. In most cases, updating the firmware is just a matter of plugging the drone into your PC via a USB cable. Since the process varies by drone, check the manual (again, read the manual) or manufacturer’s website for the precise firmware update method. Okay, now you’re ready for your first flight. Launch in an open, treeless area and head up a hundred feet or so right away. On most drones this means pushing the left control stick up for a few seconds. Then release and just sit there for a minute, keeping your eye on the drone. At this elevation, you should be clear of any obstacles. Start by getting a feel for the basic flight maneuvers: up, down, left, right. Pay special attention to how much the drone dips when you accelerate: With most models, you’ll likely find you want a bit of acceleration as you head forward to maintain a constant altitude. Try some basic maneuvers like a circling around in box, circle, and figure eight. This will help you understand how fast your drone responds to your input. Every drone in different, but the common thread in my experience with half a dozen different models is that gentle, slow movements are the best, safest way to fly. Your first instinct will be to overcorrect every time your drone is headed somewhere you don’t want it to go. Ignore it. Take a deep breath and gently correct your flight errors rather than slamming the control in the opposite direction. Another key to safe, happy drone flying is making sure you know where and how you can fly your new drone. Drone pilots do not have a stellar track record. It seems like hardly a day goes by without someone doing something stupid with a drone—interfering with firefighters, buzzing the Macy’s Thanksgiving Day parade, or poking around airports. So it’s no surprise restrictions on drones are tightening up. Local governments have already started to enact their own rules. One of the best places to learn how to fly is a large, open, tree-free area away from crowds. In most places, that’s a park or field. But many parks are starting to take a dim view of drones, in some cases banning their use. You best bet is to call your local parks department and ask, but here’s a good rule of thumb for everything to do with flying a drone: When in doubt, don’t do it. The FAA now requires all drone owners register their aircraft before flying them in US airspace. You can do thatthrough the FAA’s website or by mail. You provide your name, address, and email address, plus a $5 fee (which will be waived for the first 30 days). The registration’s good for three years, for recreational use only. If you’re not happy about the idea of telling the FAA all about your drone, the aforementioned Academy of Model Aeronautics is your best bet for fighting it. It’s also worth looking over the FAA guidelines for hobby craft. The rules are hardly draconian, and primarily reinforce what is hopefully common sense: Don’t interfere with other aircraft, don’t fly near crowds of people, don’t go over 400 feet, don’t be reckless, and so on. When you first start out flying, there’s a lot to keep track of—the drone’s POV coming in on your controller, your fingers on the flight controls, the controls for starting video and taking pictures, and of course there’s the drone itself, actually up there in the air somewhere. Try to keep in mind that the most important part of controlling your drone is knowing where it is at all times. Keep your head on a swivel and never lose positional awareness. Share the post "How to Avoid Immediately Destroying Your New Drone"